Gosau is a small community south of Bad Ischl in the Salzkammergut. The community is somewhat spread out along the creek Gosaubach. 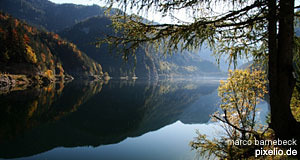 It attracts large crowds of tourists due to its picturesque surroundings: Forested mountains, creeks and the lakes Gosau Seen, the Vorderer (front) Gosausee and the Hinterer (back) Gosausee. Something unusual about Gosau: A majority of 75 percent of its population is protestant in this predominantly Catholic country. Gosau offers great access to the Dachstein region with its vast skiing areas. In terms of sightseeing, the number of attractions is very limited. The history of the village is a fairly recent one. Originally, Gosau developed as part of the Duchy of Bavaria, but turned Austrian in the 12th century. Since 1490, it was formally part of the Principality of Austria beyond Enns ("Fürstentum Österreich ob der Enns") and later Upper Austria. The rest of its history, the village had a quaint time, as the mining activities of the Salzkammergut happened elsewhere - although the mines of nearby Hallstatt did have a shaping influence on the village′s economy. During the Napoleonic Wars, Gosau was occupied repeatedly by Bavarian and French troops. Today, Gosau depends on tourism, just like most of the Salzkammergut does ever since the 19th century. Apart from skiers that enjoy its vicinity to the Dachstein, it is the two Gosau Lakes that are highly popular. The Vorderer Gosausee is theoretically a natural lake, but its water level was artificially lifted for about 12 metres in 1910 to support a local power plant. The Hinterer Gosausee is directly connected with the Hallstättersee through a cave system. It also supplies the Gosaulacke or Gosau Pool, which gains its water mostly from melting snow in spring or when the Hinterer Gosausee is goes beyond a certain water level. Particularly the Vorderer Gosausee has very clear water and is a popular destination for divers. There are several mountain huts or cabins around the lake area: The Gablonzer Hütte, the Hofpürglhütte, or the Adamekhütte. All of these cabins are connected with hiking paths. Nearby attractions include, beyond the previously mentioned Mount Dachstein with its glacier and Hallstatt, also Bad Aussee, Lake Grundlsee and the towns of Bad Goisern and Altaussee.